The annual ‘India Meets Britain Tracker’ released in London on Wednesday finds that the number of Indian companies doing business in Britain has increased from 800 in 2018 to 842 in 2019, with a combined turnover of £48 billion. The report, published by business advisory firm Grant Thornton UK LLP and the Confederation of Indian Industry (CII), revealed a more than doubling of the Corporation Tax paid by these companies to hit £684 million, up from £360 million in the previous year. “The headline figures in the Tracker are startling. They are testament to the strength and entrepreneurialism of the Indian business community, with some companies growing by more than 100% year on year,” UK minister for investment Graham Stuart said at the launch. The minister pointed out that the figures are likely to see a further jump from next year, when the UK’s Corporation Tax, from the current level of 19%, will drop to 17%. “We will always welcome Indian investments and we recognise India’s importance as one of our most critical bilateral investors,” he said. Among some of the other highlight figures from the Tracker, 24% of Indian companies in the UK have at least one woman on their board, up from 19% last year, and they employ an estimated 104,783 people in the country. “The report brings out in such graphic terms the contribution that Indian businesses are making to the UK. We all wondered how the Brexit process would have affected the investment sentiment from India and now we have the answer – Indian business retains its positive outlook towards the UK,” said Ruchi Ghanashyam, the Indian High Commissioner to the UK. The report, now in its sixth year, provides a tracker of the fastest growing Indian companies in the UK with turnover of more than $5 million, year-on-year revenue growth of at least 10% and a minimum two-year track-record in the UK. Among these Accord Healthcare Ltd, Milpharm Ltd and Secure Meters (UK) Ltd have been consistently recorded as fast growing ever since the Tracker was launched in 2014. Three companies in this year’s Tracker reported growth of more than 100%, with the fastest growing of these being TMT Metal Holdings Limited, with a growth rate of 649%. With data costs falling by 95% since 2013, India will see internet users rise by about 40% and number of smartphones to double by 2023, McKinsey said in a report. It also expects core digital sectors to jump two-fold to $355-435 billion by 2025. The report ‘Digital India - Technology to Transform a Connection Nation’ by McKinsey Global Institute said the country is one of the largest and fastest-growing markets for digital consumers, with 560 million internet subscribers in 2018, second only to China. Indian mobile data users consume 8.3 gigabits (GB) of data each month on average, compared with 5.5 GB for mobile users in China and 8-8.5 GB in advanced digital economy of South Korea. Indians have 1.2 billion mobile phone subscriptions and downloaded more apps, 12.3 billion in 2018, than residents of any other country except China. “Our analysis of 17 mature and emerging economies finds India is digitising faster than any other country in the study, save Indonesia -- and there is plenty of room to grow: just over 40% of the populace has an internet subscription,” it said. While a government push has helped digitise the economy, private sector firms such as Reliance Jio has helped bring down data costs by more than 95% since 2013, it said, adding the cost of one gigabyte fell from 9.8% of per capita monthly GDP in 2013 (roughly $12.45) to 0.37% in 2017 (the equivalent of a few cents). “Private-sector innovation has helped bring internet-enabled services to millions of consumers and made online usage more accessible. 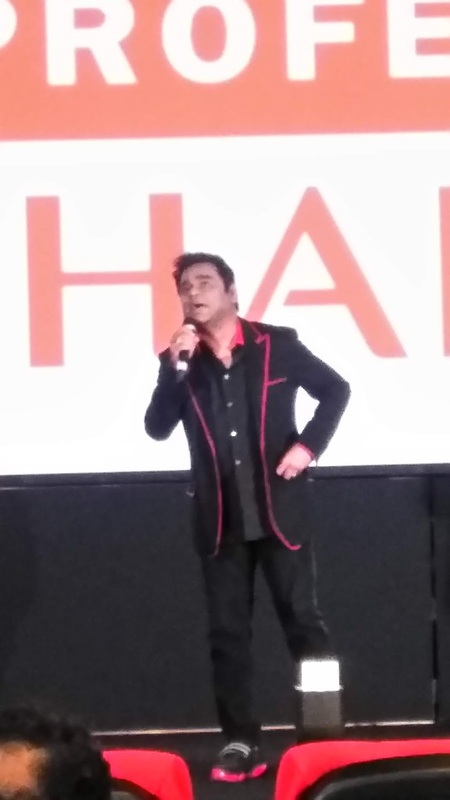 Samsung along with group company HARMAN has launched the World’s Largest Onyx Cinema LED Screen in India’s tech capital Bengaluru at the iconic Swagath Cinemas, which will now be rechristened Swagath Onyx Theatre. Academy Award winner, musician and philanthropist, AR Rahman inaugurated the new theatre today. With a 14 metre screen, the largest Onyx Cinema LED screen format in the world, Swagath Onyx Theatre on Bengaluru’s MG Road will offer powerful, captivating and larger-than-life visuals, transforming the cinema viewing experience for cine lovers. Globally, there are only two other 14 metre Onyx Cinema LED screens installed by Samsung to date, in Malaysia and China. At 618 seats, Swagath Onyx Theatre is also the world’s largest theatre that is equipped with an Onyx Cinema LED screen. Acoustics in the theatre have been dramatically upgraded with JBL Professional cinema loudspeakers from HARMAN. The Onyx screen is 3D applicable with active 3D technology for all 618 seats in the theatre. With the introduction of this new technology, Samsung will transform cinema viewing experience with HDR support offering unparalleled picture quality. With Onyx Cinema LED, movie lovers will get unparalleled picture quality, true colours and greater vibrancy and accuracy, exactly how the director intended it to be seen. The 14 metre Onyx Cinema LED Screen in Bengaluru was unveiled in the presence of Moon Goo Chin, Corporate Vice President, Consumer Electronics Business, Samsung India; Puneet Sethi, Vice President, Consumer Electronics Enterprise Business, Samsung India; Prashant Govindan, Head – Professional Solutions, HARMAN India and SAARC; Kishore P, Director, Swagath Group of Cinemas and AR Rahman. “Samsung is the only brand offering an end-to-end movie experience, from stunning visuals through Onyx Cinema LED Screens to phenomenal sound from JBL Professional by HARMAN. Onyx Cinema LED at Swagath Onyx Theatre in Bengaluru will revolutionize cinema viewing experience for film lovers in the city and across India. This is a remarkable milestone for Indian cinema and a testament to our consumer-centric approach,” said Puneet Sethi, Vice President, Consumer Electronics Enterprise Business, Samsung India. “The current wave of cinema is replete with great visuals, rich soundtracks and background score. The new Onyx Cinema LED powered by JBL’s iconic sound will transform cinematic experience for movie goers. 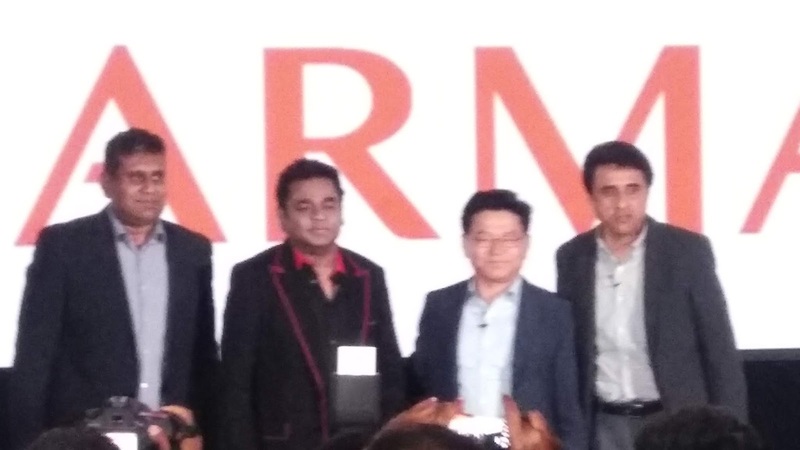 This mighty combination of a revolutionary screen and legendary sound will truly elevate the content and we are excited for Indian cinephiles to experience this epic offering,” said Prashant Govindan, Head – Professional Solutions, HARMAN India & SAARC. “At Swagath Cinemas we take pride in our heritage yet strive to provide a futuristic cinema viewing experience to our customers. Our association with Samsung to launch the World’s Largest Onyx Cinema LED Screen in Bengaluru is testimony to our commitment to movie lovers across India,” said Kishore P, Director, Swagath Group of Cinemas. The large 14 metre screen offers powerful, captivating and larger-than-life visuals with greater attention to detail. The screen is capable of delivering true colors with HDR support with greater vibrancy and accuracy along with sharp contrast, higher levels of brightness and great viewing angles that are unaffected by ambient light; eliminating optical distortion and interference. The disruptive technology is a breakthrough in the cinema industry, which has been relying on projector-based system for decades. The latest Onyx Cinema LED screen comes equipped with an array of solutions including Onyx VIEW, Onyx 3D and Onyx SOUND, providing a uniquely immersive experience. The sound system at Swagath Onyx Theatre is comprised of Onyx Sound, an innovative audio solution that incorporates industry leading products from the HARMAN family of brands including Crown amplifiers, BSS signal processing, and JBL Professional’s loudspeakers and exclusive Sculpted Surround technology. The Onyx Sound reproduces today’s dynamic soundtracks with stunning clarity and detail. The system includes six JBL AM 7315 screen array loudspeakers, four JBL 9300 cinema surround loudspeakers, eighteen JBL 9350 + four JBL SCS 12 high impact cinema surround loudspeakers, six JBL AC28/26 used as underfills for the balcony area and nine JBL 5628 dual 18" cinema subwoofers. Processing is provided by a BSS networked audio system, and the entire system is powered by 31 Crown DSi amplifiers. Apart from the new Onyx Cinema LED Screen, Swagath Onyx Theatre in Bengaluru has also upgraded its overall look and feel inside the theatre with refurbished interiors and comfortable seats, even as it retains its heritage look on the outside. The Onyx display easily accommodates any venue configuration while delivering unmatched visual quality, technical performance and reliability over traditional projectors. The screen maintains its advanced presentation capabilities in ambient lighting conditions, regardless of the featured on-screen content. It also allows theatre owners to utilize their theatres for corporate events, concerts and sports event viewing and gaming competitions. Onyx SOUND: The screen offers state-of-the-art Onyx surround sound experience, the result of research and co-development by HARMAN and Samsung’s Audio Lab, bringing scenes to life through clear and precise audio. This innovative audio solution solves the challenges posed for center channel audio when incorporated with a solid cinema LED screen, which does not allow for the placement of loudspeakers behind the screen, which is the common placement in traditional cinemas. When combined together with JBL’s Sculpted Surround technology, Onyx Sound creates a seamless, immersive audio experience for viewers, regardless of their seat location, that further enhances the already stunning visuals offered by Onyx. Onyx VIEW: Combined with an infinite contrast ratio and specialized low-tone greyscale settings, Onyx VIEW delivers brighter and more detail-rich content. The screen delivers High Dynamic Range (HDR) to cinema, showcasing on-screen contents at peak brightness level – nearly 10 times greater than that offered by standard cinema projectors (146fL versus 14fL). The display delivers improved uniformity, free of optical distortion and interference. It is industry’s first DCI-certified cinema display available in 5, 10 and 14 metres width. 3D Onyx Cinema LED: This screen makes 3D movie content more realistic through enhanced brightness and consistent colour amplification. Glass-wearing viewers can now have the benefit of watching subtitle texts, images and even minor visual details with unprecedented clarity. Lowe’s India, a Bangalore based retail technology and analytics centre for Lowe’s Companies Inc with over 2000 associates in India is extending support to the recently affected employees of JET Airways for its IT division. The sudden shut down of the airline’s operation has left many employees of Jet Airways unemployed. Staying true to its purpose, Lowe’s India has always served to help people where they live and observing the current status of sudden unemployment, Lowe’s India has taken an initiative to announce hiring with a fast-track process. The employees of JET Airways can apply across IT positions of Lowe’s India. Taking a step further, Lowe’s India also wrote to Jet Airways HR on partnering and placing their employees directly. “Lowe’s India is a part of an eco-system and during an employment crisis such as this, we believe as a good corporate citizen that we will do what matters to people and communities around us. We are reaching out to the technology employees of Jet Airways directly and so far, we have seen a good response, both from their employees and third-party companies servicing Jet as a client. We are scanning the resumes and are open to Jet reaching out to us to partner for placements said James Brandt, SVP & Managing Director – Lowe’s India. 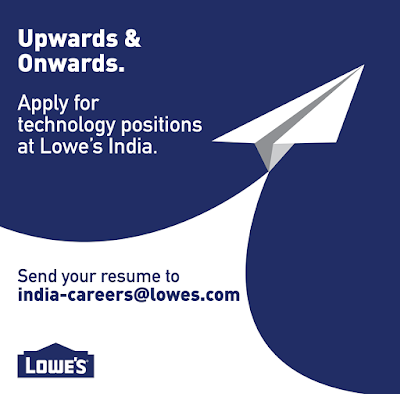 Interested candidates can send their resumes to india-careers@lowes.com, with the subject line “Jet IT” and Lowe’s team will fast-track the process to schedule a meeting with selected candidates. Blueprint Technologies has announced that it is the recipient of the prestigious ‘HR Cloud Partner of the Year 2018’ Award at SAP India Partner Summit 2019. The SAP Partner Awards are presented annually to the top SAP partners that have excelled in developing and strengthening their alliance with SAP to drive customer success. The nominations for the SAP Partner India Summit Awards are based on field recommendations, customer feedback, and various other performance indicators including internal SAP sales data during the period FY 2018-19. A steering committee composed of regional and global SAP representatives determined winning partners in each category for General Business and Strategic Alliances for the Indian Subcontinent. Blueprint Technologies (BPTERP) is a pioneer among premier IT and ERP consulting houses in India. Employing an innovative approach, BPTERP’s mainstream business focus on SAP, SAP S/4HANA, SAP SuccessFactors, SAP Concur has enabled India’s leading E-commerce, Travel, Healthcare, BFSI and many consumer brands solve complex IT, HR and business problems and create real revenue generating value. 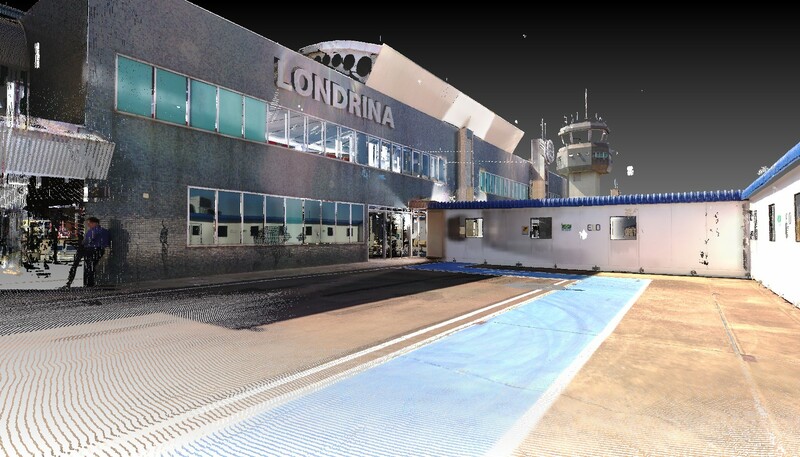 Londrina Airport will be the first in Brazil to have a digital twin. The final product will include 3D modeling of 20 buildings, one take-off-and-landing runway, two aircraft yards, taxiways, and access roads—a total airport surface area of 920,354 square meters. Infraero is going digital to improve its business intelligence and decision making. By leveraging digital DNA to manage its assets, Infraero can take a more preventative approach to maintenance, effectively use airport space, and improve airport safety. Maintenance teams will be able to utilize real-time monitoring and control of assets for improved efficiency of remote asset management. The model will serve as a large-scale information repository to improve performance and obtain data more efficiently. The digital engineering information, or digital DNA, of the project was modeled using Bentley’s design software. MicroStation’s point-cloud import feature enabled the team to model the entire airport via point clouds and conduct point-cloud studies to verify the existing facilities. OpenBuildings Designer was used to model existing buildings, such as the passenger terminal, cargo terminal, and fire station. OpenRoads was used to create the geometric project and runway system surfaces map: a comprehensive model of take-off and landing runways, taxiways, and service roads. When complete, the comprehensive building and infrastructure model will serve as a basis for future airport expansion projects, enable effective maintenance, cut maintenance costs, and increase asset availability. The live model will also facilitate a range of studies: passenger flow, demand and capacity, layout changes, and launch studies for new commercial areas. Infraero has already experienced savings of BRL 540,000 per year with improved information management. The company plans to expand its use of BIM methods in the operation and maintenance phase of its other assets. The Digital Airport Pilot Project at Londrina Airport will serve as a model as the other 53 airports managed by Infraero seek to effectively leverage their digital DNA. Londrina Airport is the first airport in the region to effectively leverage its digital DNA to improve business intelligence, asset management, and operations; it serves as an example for other airport owner-operators in the region that seek to promote safe and high-quality airport infrastructure. GS Caltex India, a 100% owned subsidiary of GS Caltex Corporation, South Korea has signed on cricketer Shikhar Dhawan as a brand ambassador in a strategic move to establish itself as a major player in the premium lubricants category in the country. As part of the association, Shikhar Dhawan will be the face of GS Caltex India for the company’s premium lubricants range & new business initiatives. Speaking about the importance of this strategic alliance, Mr. Rajesh Nagar, MD & CEO, GS Caltex India Pvt. Ltd. said, “It’s a perfect match in more ways than one, especially since both Shikhar and GS Caltex are Smart Performers and setting new benchmarks in their respective fields. GS Caltex India is a 100% owned subsidiary of GS Caltex Corporation, South Korea. The company is currently doing business in high quality premium lubricants manufactured from its own Group II plus base oils imported from its Yeosu Refinery, South Korea. The company has also expanded into other businesses like Polymers, Polypropylene and petrochemicals. GS Caltex India has a very impressive range of high-quality finished lubricants and supplies to large businesses including major global OEMs.